Food sources of nutrients. 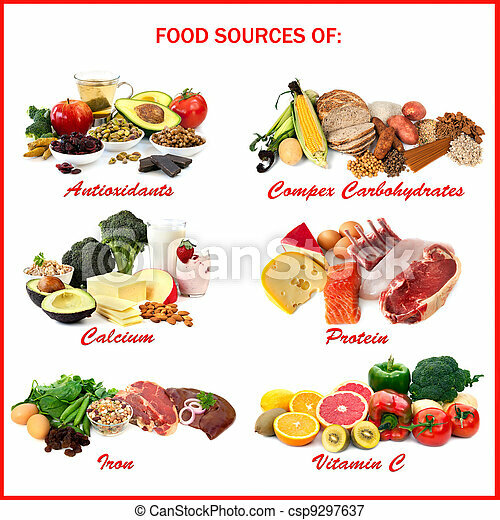 Chart showing food sources of various nutrients, each isolated on white. includes antioxidants, complex carbohydrates, calcium, protein, iron and vitamin c.
Chart showing food sources of various nutrients, each isolated on white. 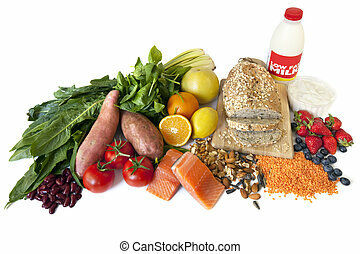 Includes antioxidants, complex carbohydrates, calcium, protein, iron and vitamin C.
Selection food sources of omega 3 . 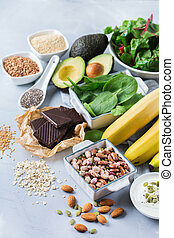 Superfood high unsaturated fats for healthy food. Nutshell and lentils flat lay on white wooden table. Selection food sources of omega 3 . 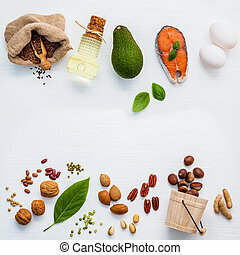 Super food high omega 3 and unsaturated fats for healthy food. 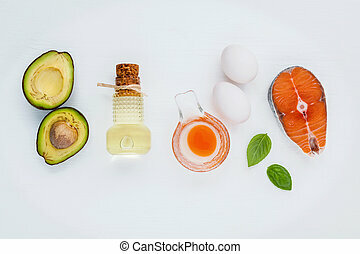 Olive oils ,salmon ,eggs and avocado on white wooden background. Selection food sources of omega 3 . 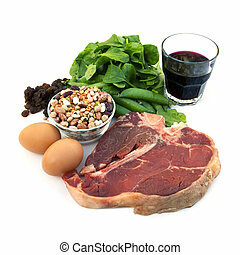 Super food high omega 3 and unsaturated fats for healthy food. 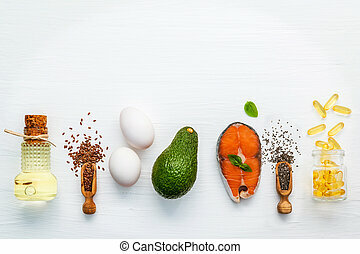 Olive oils ,salmon ,flax seeds ( linseed ) ,eggs and avocado on white wooden background. Selection food sources of omega 3 . 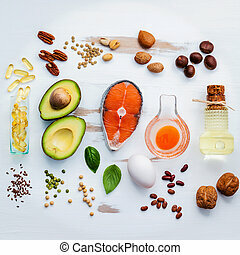 Super food high omega 3 and unsaturated fats for healthy food. Almond ,pecan ,hazelnuts,walnuts ,olive oils ,fish oils ,salmon ,flax seeds ,chia ,eggs,lentils and avocado . Selection food sources of omega 3 . 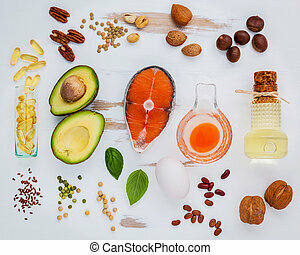 Super food high omega 3 and unsaturated fats for healthy food. Almond ,pecan ,hazelnuts,walnuts ,olive oils ,fish oils ,salmon ,flax seeds ,chia ,eggs and avocado . Selection food sources of omega 3 . 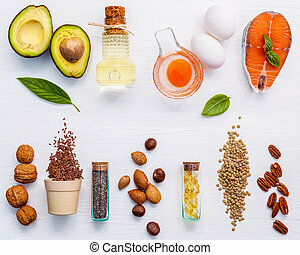 Super food high omega 3 and unsaturated fats for healthy food. Extra virgin olive oils ,salmon fillet ,flax seeds ,white eggs and avocado on white wooden table. Selection food sources of omega 3 . 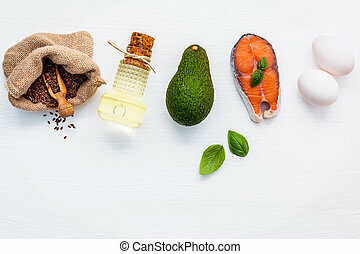 Super food high omega 3 and unsaturated fats for healthy food. 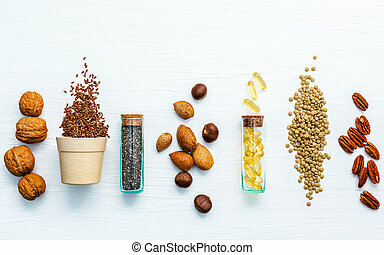 Almond ,pecan ,hazelnuts,walnuts ,fish ,flax seeds ,chia and lentils on white wooden background. Selection food sources of omega 3 . 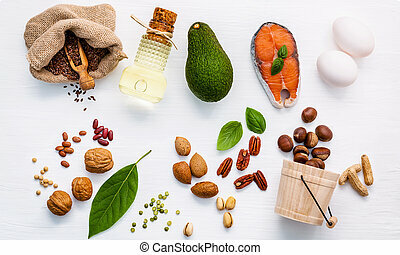 Super food high omega 3 and unsaturated fats for healthy food. 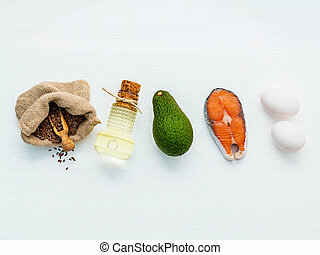 Olive oils ,salmon ,flax seeds ( linseed ) ,chia seeds,eggs and avocado on white wooden background. Selection food sources of omega 3 . 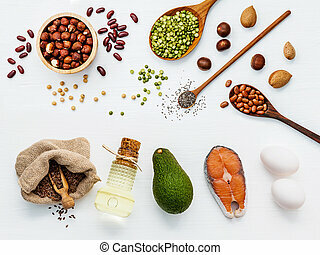 Super food high omega 3 and unsaturated fats for healthy food. 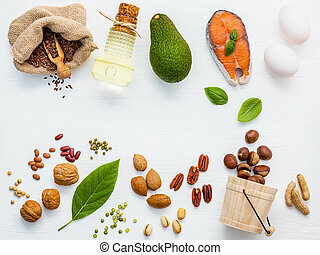 Almond ,pecan ,hazelnuts,walnuts ,olive oils ,fish oils ,salmon ,flax seeds, peanut, eggs and avocado . Selection food sources of omega 3 . 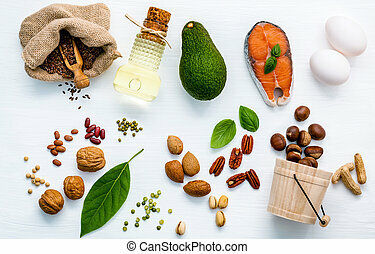 Super food high omega 3 and unsaturated fats for healthy food. 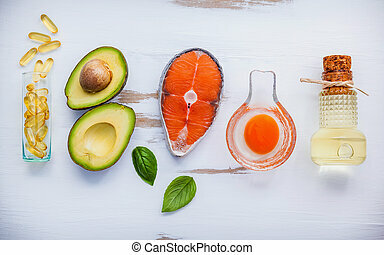 Halve avocado ,extra virgin olive oil ,fish oil capsules ,white eggs and salmon fillets on white wooden background. 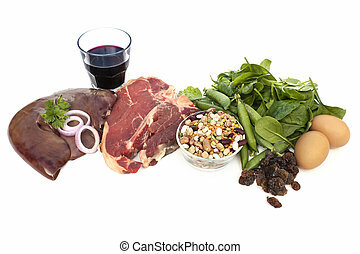 Food sources of iron, isolated on white. 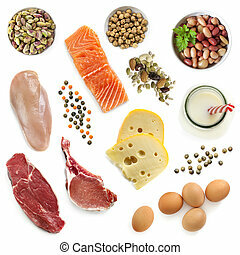 Food sources of protein, including cheese, lentils, red and white meat, kidney beans, fish, tuna, nuts and eggs. 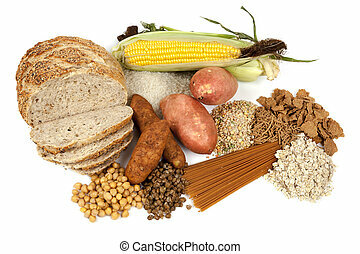 Food sources of complex carbohydrates, isolated on white background. 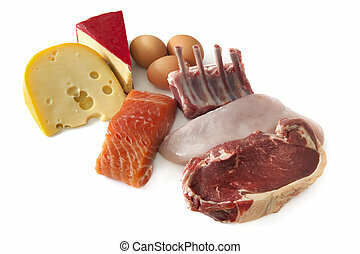 Food sources of protein, isolated, top view. 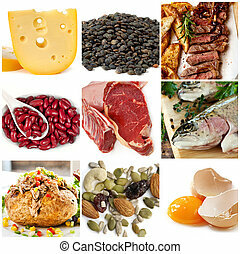 Includes meat, fish, dairy, beans, nuts and seeds. 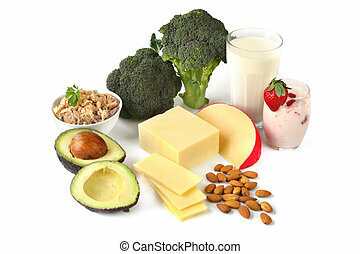 Calcium-rich foods, on white background. 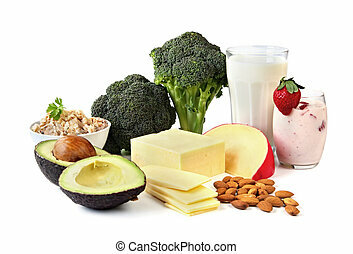 Includes avocado, salmon, broccoli, milk, yoghurt, cheeses, and almonds. 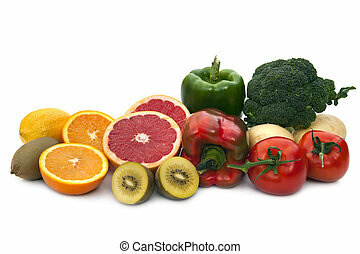 Foods rich in Vitamin C. Includes broccoli, potatoes, tomatoes, bell peppers, grapefruit, kiwi fruit, oranges and lemons. 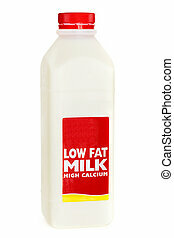 Bottle of low fat milk, isolated on white. Red cap and label. 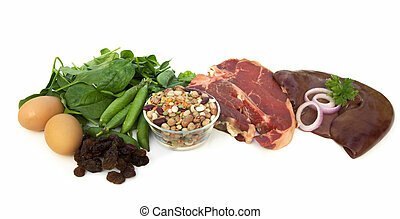 Food sources of iron, including red meat, eggs, spinach, peas, beans, raisins and prune juice. Isolated on white. 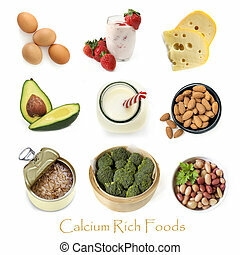 Collection of calcium rich foods isolated on white. 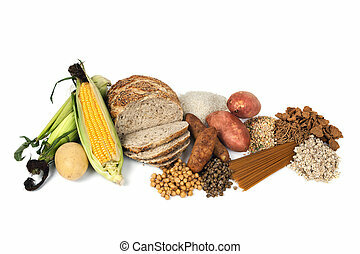 Foods designated \"Diabetes Superfoods\", because of their low glycemic index, and valuable nutrients. Includes: beans, leafy green vegetables, fish, sweet potatoes, tomatoes, citrus fruit, whole grains, nuts and seeds, berry fruit, and low-fat milk and yogurt.